For years, I have preached the value of measuring your height once a year. Very few clues give signs of underlying problems with your bones. Height loss is one of those clues. In order to find out, your height needs to be accurately measured. 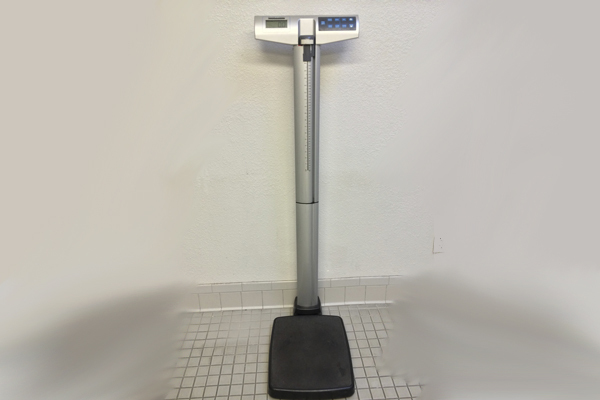 A doctor’s balance beam scale is accurate for weight but the accompanying pull up measuring device is not. Therefore, a stadiometer is recommended for measuring your height once a year. A stadiometer is a separate or wall-mounted device that can be simply constructed of a of a ruler and a sliding horizontal headpiece that is adjusts to rest on the top of your head. Even simply standing up against the wall should give an accurate value much like marks on the doorframe perhaps when you were growing up. Have you had your height measured lately? If not, it’s time to do it. Even though there are many different reasons for height loss, silent spine fractures are one important cause. This week I had a routine doctor’s visit. The medical assistant checked me in. We walked right past the scale and into an examining room. The first question to me was, “What is your weight?” I paused a moment to make sure I heard the question correctly, while thinking, are you kidding me? Gee, what number should I make up? I gave my ideal weight rather than my actual weight. We always want to look good after all, at least on paper. Despite the medical privacy act, who knows who has access to information in medical records as well as all those releases you may have given permission for access to your records. Next she asked me to roll my sleeves to take my blood pressure. My blood pressure was higher than it ever been. Maybe I took the check in a little too seriously or maybe it was the extra pounds that I was sporting. Is this the new standard of care? Self-report your height and weight. I don’t want to name names but I was at the “Center for Excellence” which is my local academic medical center.